The air is cold and crisp this January! A good time to remember “On This Winter Day” quilt by Nancy Prince and Linda French that won “Best of Show” at the 2014 International Quilt Festival in Houston, Texas. 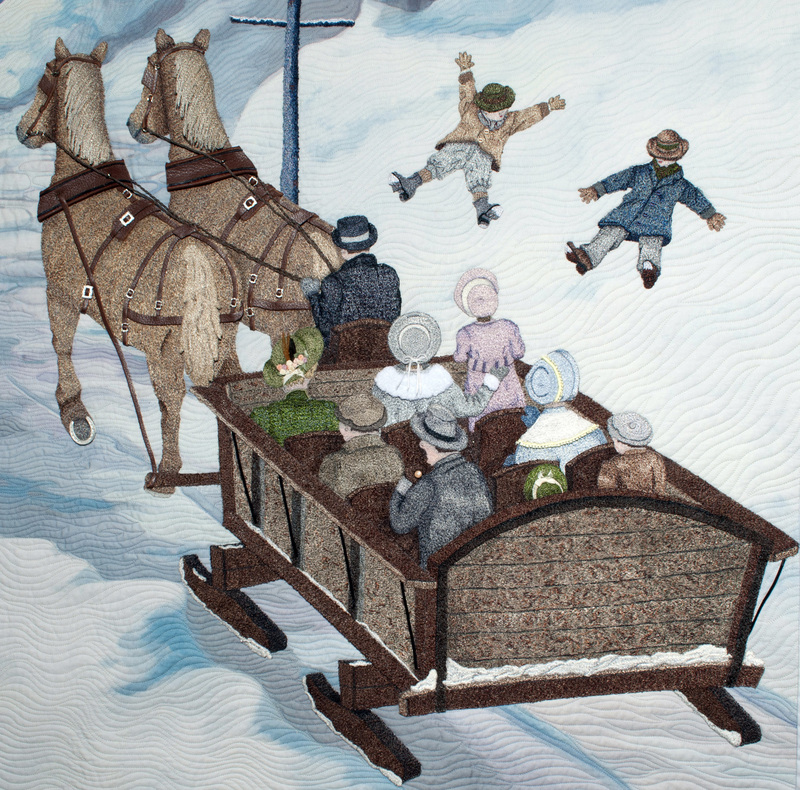 On This Winter Day won Best of Show at the International Quilt Show in Houston in October 2014. 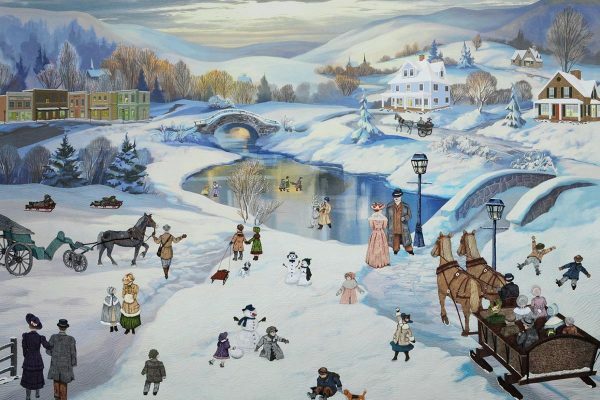 Over 2,000 hours within 7 years were necessary to design and thread paint all the people, animals and sleighs. My BERNINA 830 was put to good use while 75,000 yards of thread and 7 million stitches sailed through its needle. Polyester and silk thread were used to create the thread figures and the B 830 worked like a charm with both the heavy and thin threads. The largest thread appliqué (12″) was the lady and man in the lower left hand corner and the smallest (1″) was the little girl in yellow skating on the pond. 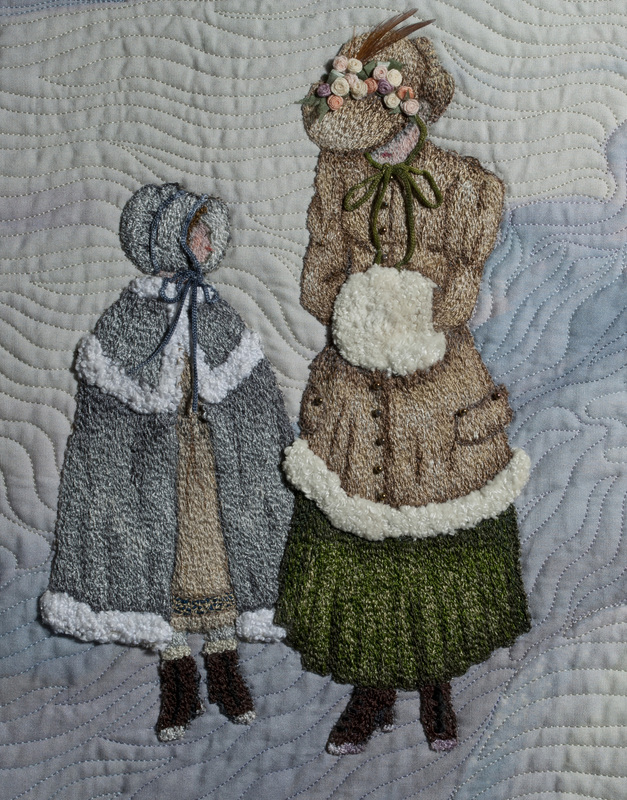 The fur on the ladies’ coats was made by hand using Punch Needle which gave the fur a raised look. Small silk flowers were purchased at a miniature shop for accents on the hats. The background was digitally produced and the image commercially printed on fabric. Real buckles and horseshoes were purchased to authenticate the leather bridals, driving harnesses, girths and traces of the large horses on the bottom right. Due to the effect of distortion, the large sleigh was made in 25 sleigh pieces and 9 people and was put together like a puzzle at the end. The village shops and houses were constructed using SketchUp. This program allows architecturally correct houses and village shops and allows features and people to be inserted behind the windows to give them a lived-in look. 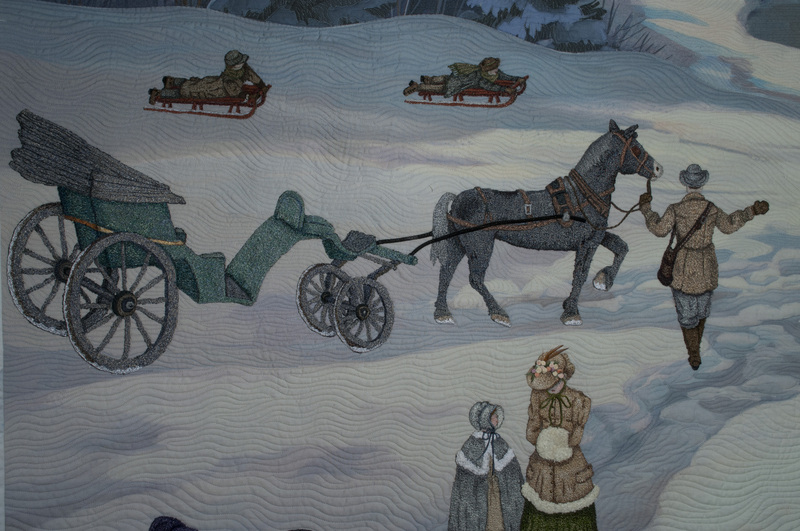 The landscape style quilting was done by Linda French. Emphasis on the quilting was to show changes in terrain lines. Linda used approximately 45 different colors of 100 weight silk thread to transform the background, changing colors of thread as the background changed colors. Linda has won numerous Best of Show awards on her own but this was the first one at Houston. 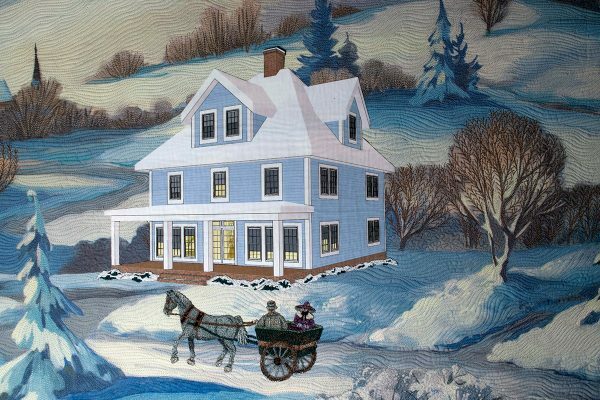 Traditional quilting is what she is known for but she out did herself with the detail she put into the landscape quilting required for On This Winter Day. The Free Hand System on my B 830 was the feature I used most often while thread painting. I just can’t imagine repositioning and changing thread without it. Needless to say thread painting can adversely affect the tension on the machine due to the constant insertion of thread after thread so over time the tension needs to be adjusted. The B 830 made adjusting the top and bottom tension a breeze. After 7 years, it was a huge sense of accomplishment to see what years of planning and stitching resulted in. On This Winter Day also won the Masterpiece Award at Road to California, 1st place in Large Long Arm Quilts at AQS in Lancaster and Viewer’s Choice at the AQS show in Paducah. Unbelievably gorgeous! I would love to read and see a more in depth interview and review. I think the ladies could have a book just about the process of designing and quilting this quilt. Coloring is known to be therapeutic…and who wouldn’t love such a delight with which to relax? I would. Even if I don’t win, thanks for offering this give-away. Someone will love it! Thank you for providing background information on how this stunning quilt was made. I was lucky enough to see it in person at Road to California. It is amazing. I saw this quilt at Lancaster last March, it was magnificent!!! The photos are great but they don’t do it justice. 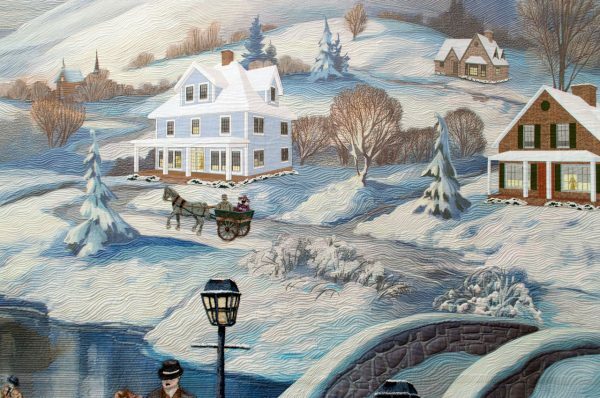 What an amazing masterpiece and a beautiful heirloom to leave to your family. It is truly beautiful and I’d love to see more pictures or a video tour of this quilt. Will this quilt be at the Chicago show in April? It is____without a doubt____the_____most beautiful quilt I have ever seen! I was star stuck when I seen this Beautiful Quilt at the show !! To Win this quilt by such talented artists would be a true Honor !! This is the most beautiful amazing quilt. Fortunate enough to view it at an AQS show. Thanks for the background info.